What Day Of The Week Is April 28? 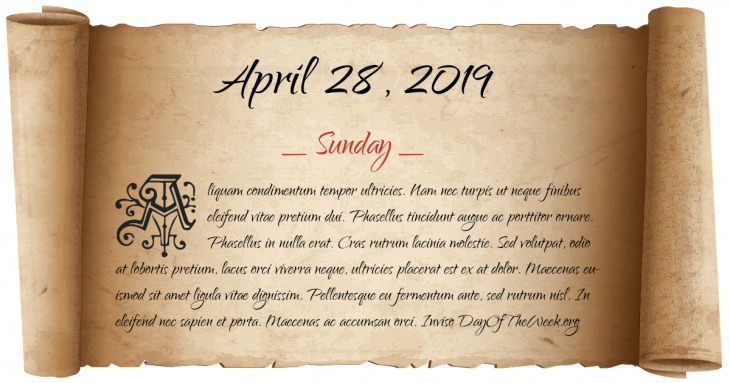 April 28, 2019 is the 118th day of the year 2019 in the Gregorian calendar. There are 247 days remaining until the end of the year. The day of the week is Sunday. Emperor Constantius II enters Rome for the first time to celebrate his victory over Magnus Magnentius. France invades the Austrian Netherlands (present day Belgium), beginning the French Revolutionary War. World War II: Nine German S-boots attacked US and UK units during Exercise Tiger, the rehearsal for the Normandy landings, killing 946. Benito Mussolini and his mistress Clara Petacci are executed by a firing squad consisting of members of the Italian resistance movement. Thor Heyerdahl and five crew mates set out from Peru on the Kon-Tiki to prove that Peruvian natives could have settled Polynesia. Occupied Japan: The United States occupation of Japan ends as the Treaty of San Francisco, ratified September 8, 1951, comes into force. In Tasmania, Australia, Martin Bryant goes on a shooting spree, killing 35 people and seriously injuring 21 more. Who were born on April 28?